The crisis in Manipur University worsened with seven heads of departments of the university tendering their resignations in support of the students’ demand for removal of the Vice-Chancellor, Adya Prasad Pandey. The heads of departments of the varsity tendered their resignations amid the protest rally jointly taken out by Manipur University Student’s Union (MUSU), Manipur University Teacher’s Association (MUTA) and Manipur University Staff’s Association (MUSA) against the VC on Saturday. The students, teachers and non-teaching staff of Manipur University took out the mass rally to ‘Save Manipur University’ on Saturday afternoon. 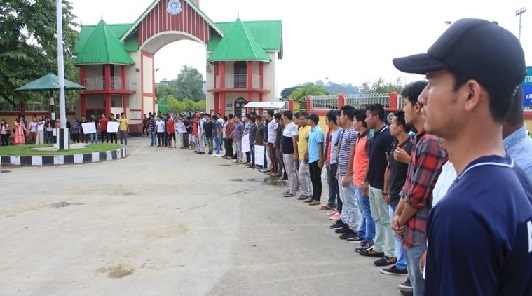 The mass rally started from the main gate of the University at Canchipur around 12 noon and marched till Kakwa bazaar along the busy Imphal-Moreh sector of the National Highway 102 and returned to the university campus for a meeting. It may be recalled that MUSU launched indefinite shut down of the university from May 30 demanding removal of the vice-chancellor over 15 allegations of financial and administrative irregularities including regular unofficial tours and violation of the university Act. The move of the MUSU was also supported by the MUTA, MUSA and locals residing around the university campus. MUTA also demanded constitution of a High Level Enquiry Commission immediately to look into the allegations of financial and administrative irregularities of the present vice chancellor and bring an amicable solution to regain the academic atmosphere of the university. MUTA had even taken a decision in this regard a day after VC Prof Pandey rejected the allegations leveled against him. He said he came here to serve the university claiming that he is trying his best to resolve the ongoing crisis. As there is no sign of resolving the ongoing crisis in Manipur University, it has already hit the academic atmosphere in the lone university and other affiliated colleges in the state since then.